Engineers at NASA’s Glenn Research Center are advancing the propulsion system that will propel the first ever mission to redirect an asteroid for astronauts to explore in the 2020s. 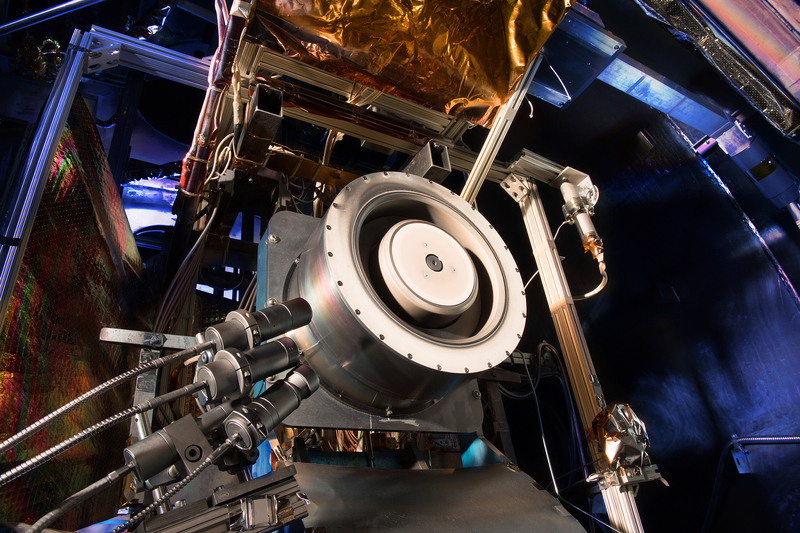 NASA’s Asteroid Redirect Mission will test a number of new capabilities, like advanced Solar Electric Propulsion (SEP), needed for future astronaut expeditions into deep space, including to Mars. The Hall thruster is part of an SEP system that uses 10 times less propellant than equivalent chemical rockets. In a recent test, engineers from Glenn and the Jet Propulsion Laboratory, using a Glenn vacuum chamber to simulate the space environment, successfully tested a new, higher power Hall thruster design, which is more efficient and has longer life. “We proved that this thruster can process three times the power of previous designs and increase efficiency by 50 percent,” said Dan Herman, Electric Propulsion Subsystem lead. Hall thrusters trap electrons in a magnetic field and use them to ionize the onboard propellant. The magnetic field also generates an electric field that accelerates the charged ions creating an exhaust plume of plasma that pushes the spacecraft forward. This method delivers cost-effective, safe and highly efficient in-space propulsion for long duration missions. In addition to propelling an asteroid mission, this new thruster could be used to send large amounts of cargo, habitats and other architectures in support of human missions to Mars. 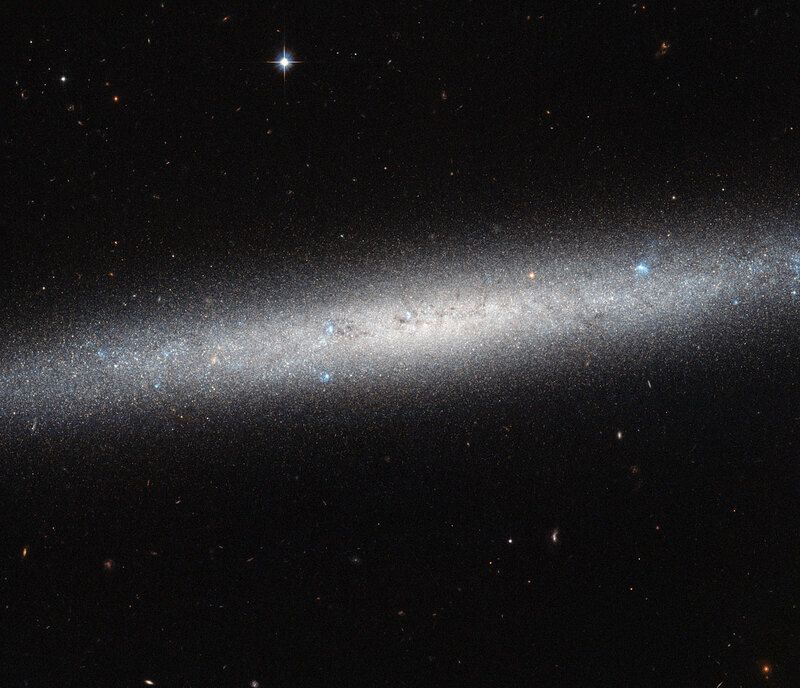 This NASA/ESA Hubble Space Telescope image shows an edge-on view of the spiral galaxy NGC 5023. Due to its orientation we cannot appreciate its spiral arms, but we can admire the elegant profile of its disk. The galaxy lies over 30 million light-years away from us. NGC 5023 is part of the M51 group of galaxies. The brightest galaxy in this group is Messier 51, the Whirlpool Galaxy, which has been captured by Hubble many times. NGC 5023 is less fond of the limelight and seems rather unsociable in comparison — it is relatively isolated from the other galaxies in the group. Astronomers are particularly interested in the vertical structure of disks like these. By analyzing the structure above and below the central plane of the galaxy they can make progress in understanding galaxy evolution. Astronomers are able to analyze the distribution of different types of stars within the galaxy and their properties, in particular how well evolved they are on the Hertzsprung–Russell Diagram — a scatter graph of stars that shows their evolution. NGC 5023 is one of six edge-on spiral galaxies observed as part of a study using Hubble’s Advanced Camera for Surveys. They study this vertical distribution and find a trend which suggests that heating of the disc plays an important role in producing the stars seen away from the plane of the galaxy. In fact, NGC 5023 is pretty popular when it comes to astronomers, despite its unsociable behavior. The galaxy is also one of 14 disk galaxies that are part of the GHOSTS survey — a survey which uses Hubble data to study galaxy halos, outer disks and star clusters. It is the largest study to date of star populations in the outskirts of disk galaxies. The incredible sharp sight of Hubble has allowed scientist to count more than 30,000 individual bright stars in this image. This is only a small fraction of the several billion stars that this galaxy contains, but the others are too faint to detect individually even with Hubble. 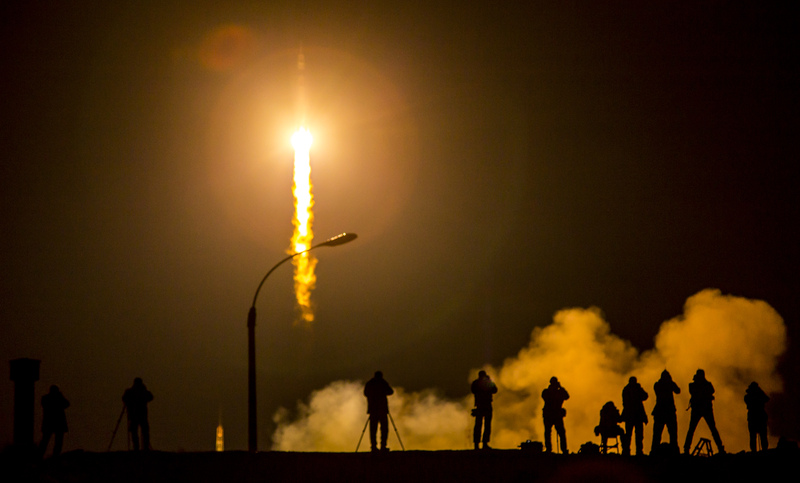 Media photograph the Soyuz TMA-16M spacecraft as it launches to the International Space Station with Expedition 43 NASA astronaut Scott Kelly, Russian cosmonauts Mikhail Kornienko and Gennady Padalka of the Russian Federal Space Agency (Roscosmos) onboard at 3:42 p.m. EDT Friday, March 27, 2015 (March 28 Kazakh time) from the Baikonur Cosmodrome in Kazakhstan. As the one-year crew, Kelly and Kornienko will return to Earth on Soyuz TMA-18M in March 2016. 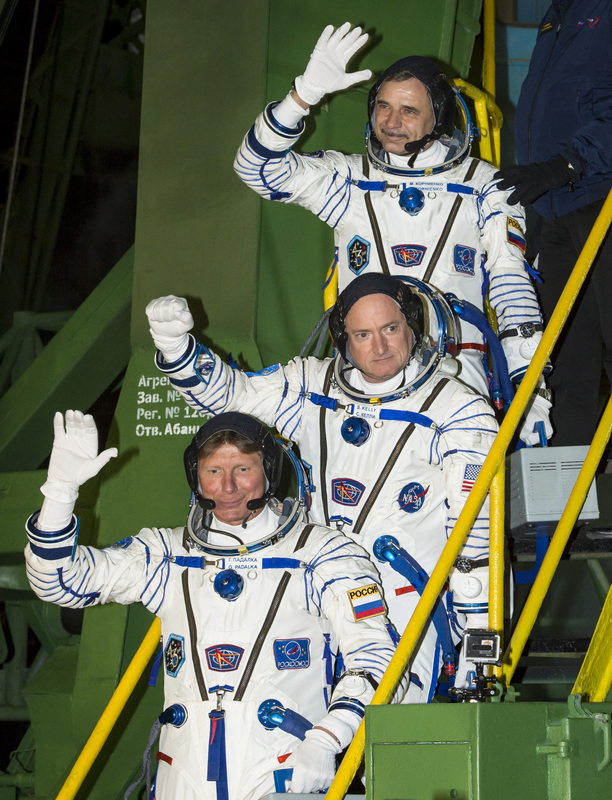 Expedition 43 Russian cosmonaut Mikhail Kornienko of the Russian Federal Space Agency (Roscosmos), top, NASA astronaut Scott Kelly, center, and Russian cosmonaut Gennady Padalka of Roscosmos wave farewell as they board the Soyuz TMA-16M spacecraft ahead of their launch to the International Space Station, Friday, March 27, 2015 in Baikonur, Kazakhstan. Kelly and Kornienko will spend a year in space and return to Earth on Soyuz TMA-18M in March 2016. Most expeditions to the space station last four to six months. By doubling the length of this mission, researchers hope to better understand how the human body reacts and adapts to long-duration spaceflight. This knowledge is critical as NASA looks toward human journeys deeper into the solar system, including to and from Mars, which could last 500 days or longer. 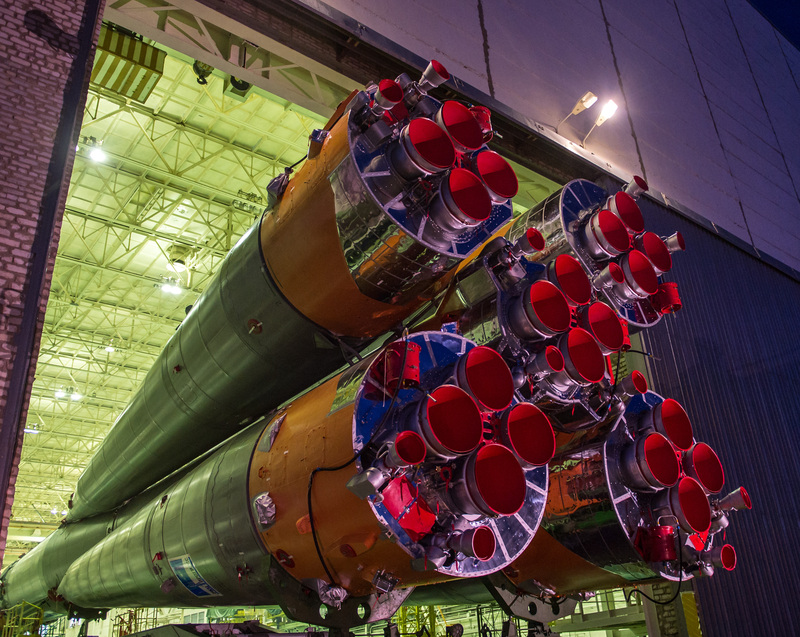 The Soyuz is set to lift off at 3:42 p.m. EDT, Friday, March 27 on a six-hour, four-orbit flight to the station. 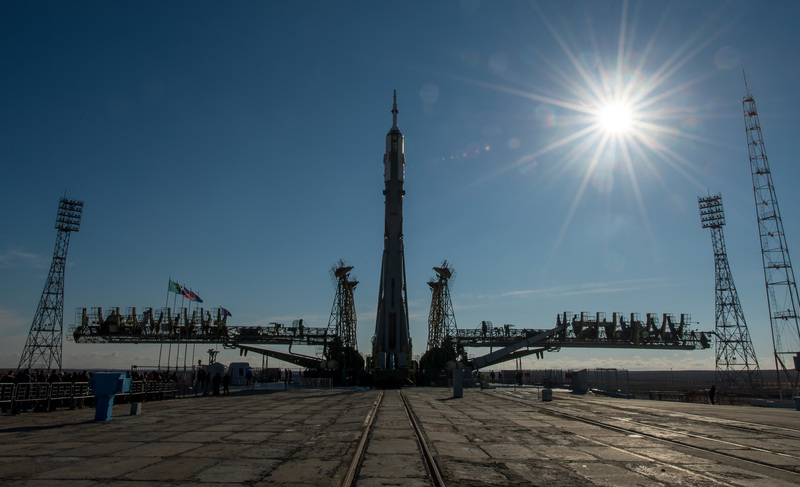 The Soyuz TMA-16M spacecraft is seen after having rolled out by train to the launch pad at the Baikonur Cosmodrome, Kazakhstan, Wednesday, March 25, 2015. NASA astronaut Scott Kelly and Russian cosmonauts Mikhail Kornienko and Gennady Padalka of the Russian Federal Space Agency (Roscosmos) are scheduled to launch to the International Space Station in the Soyuz at 3:42 p.m. EDT, Friday, March 27 (March 28, Kazakh time). As the one-year crew, Kelly and Kornienko will return to Earth on the Soyuz TMA-18M in March 2016. Most expeditions to the space station last four to six months. By doubling the length of this mission, researchers hope to better understand how the human body reacts and adapts to long-duration spaceflight. This knowledge is critical as NASA looks toward human journeys deeper into the solar system, including to and from Mars, which could last 500 days or longer. The Soyuz TMA-16M spacecraft is rolled out by train to the launch pad at the Baikonur Cosmodrome, Kazakhstan, Wednesday, March 25, 2015. NASA Astronaut Scott Kelly, and Russian Cosmonauts Mikhail Kornienko, and Gennady Padalka of the Russian Federal Space Agency (Roscosmos) are scheduled to launch to the International Space Station in the Soyuz TMA-16M spacecraft from the Baikonur Cosmodrome in Kazakhstan March 28, Kazakh time (March 27 Eastern time.) As the one-year crew, Kelly and Kornienko will return to Earth on Soyuz TMA-18M in March 2016. More information on one year crew. The rover team selected Marathon Valley as a science destination because observations of this location using the Compact Reconnaissance Imaging Spectrometer for Mars (CRISM) instrument on NASA’s Mars Reconnaissance Orbiter yielded evidence of clay minerals, a clue to ancient wet environments. By the time Opportunity explores Marathon Valley, the rover will have exceeded a total driving distance equivalent to an Olympic marathon. Opportunity has been exploring the Meridiani Planum region of Mars since January 2004. 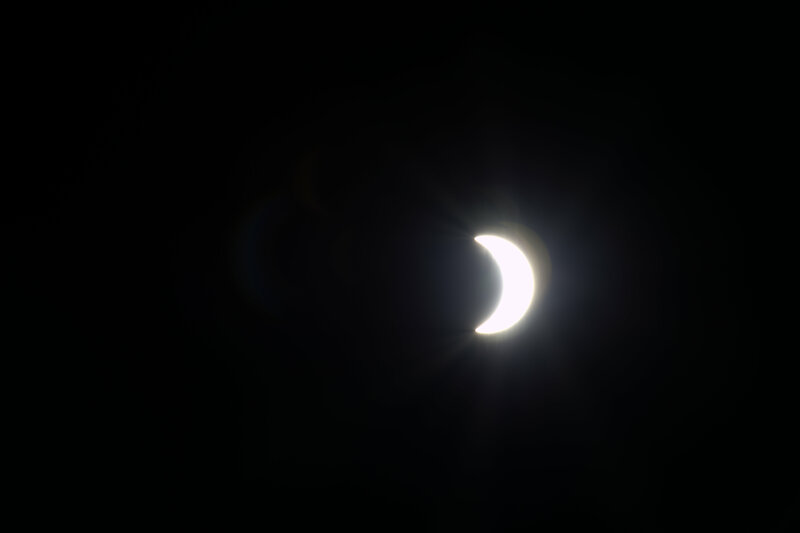 This version of the image is presented in approximate true color by combining exposures taken through three of the Pancam’s color filters at each of the four camera pointings, using filters centered on wavelengths of 753 nanometers (near-infrared), 535 nanometers (green) and 432 nanometers (violet). In a span of 20 months from March 1965 to November 1966, NASA developed, tested and flew transformative capabilities and cutting-edge technologies in the Gemini program that paved the way for not only Apollo, but the achievements of the space shuttle, building the International Space Station and setting the stage for human exploration of Mars. The first crewed Gemini flight, Gemini III, lifted off Launch Pad 19 at 9:24 a.m. EST on March 23, 1965. The spacecraft “Molly Brown” carried astronauts Virgil I. “Gus” Grissom, command pilot, and John W. Young, pilot, on three orbits of Earth. NASA’s two-man Gemini spaceflights demonstrated that astronauts could change their capsule’s orbit, remain in space for at least two weeks and work outside their spacecraft. They also pioneered rendezvous and docking with other spacecraft. All were essential skills to land on the moon and return safely to Earth. Veteran Mercury astronaut Grissom was selected as command pilot of Gemini III, making him the first person traveling into space twice. Joining Grissom was Young, the first member of the second group of NASA pilots to fly in space. Young would go on to become the first person to make six spaceflights, including commanding Apollo 16 during which he walked on the moon. He also commanded STS-1, the first shuttle mission. Gemini III’s primary goal was to test the new, maneuverable spacecraft. In space, the crew members fired thrusters to change the shape of their orbit, shift their orbital plane slightly, and drop to a lower altitude. The revolutionary orbital maneuvering technology paved the way for rendezvous missions later in the Gemini Program and proved it was possible for a lunar module to lift off the moon and dock with the lunar orbiting command module for the trip home to Earth. It also meant spacecraft could be launched to rendezvous and dock with an orbiting space station. The decision to shutter the college, a women’s liberal arts school in Virginia, has stunned students, teachers and alumnae, some of whom are rallying to try to save it. A solar eclipse occurs when the moon passes between Earth and the sun, casting a shadow over Earth. The moon’s shadow masks the solar surface and blocks sunlight from reaching Earth directly – but the amount of sunlight blocked depends on location.